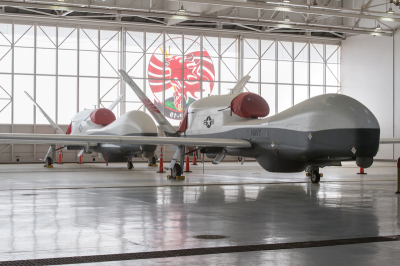 POINT MUGU, Calif. --- Northrop Grumman Corp. joined the U.S. Navy in officially welcoming the MQ-4C Triton unmanned aircraft system to the fleet with a ceremony on May 31 to celebrate the commencement of flight operations. 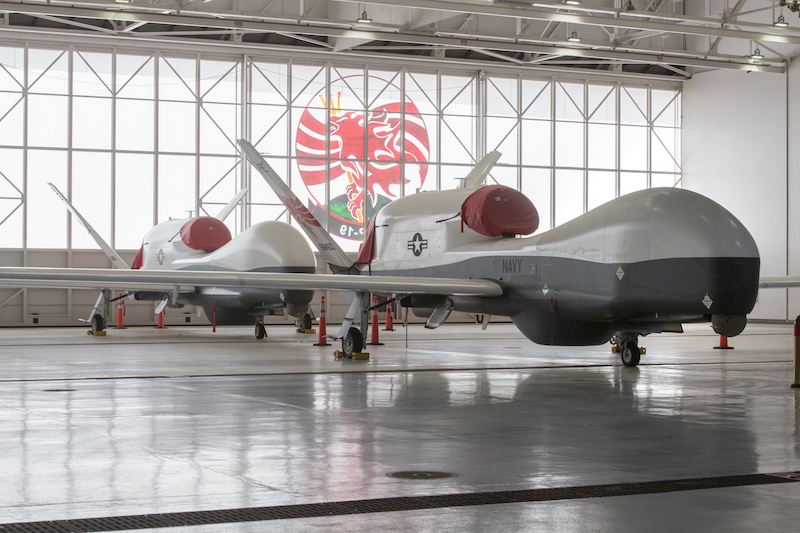 The first two operational MQ-4C Triton aircraft at home in their newly refurbished hangar at Naval Base Ventura County, Point Mugu. The insignia of Unmanned Patrol Squadron (VUP)-19, the Navy’s first unmanned patrol squadron, can be seen behind them. Naval Base Ventura County (NBVC) Point Mugu is home to the maintenance detachment of Unmanned Patrol Squadron (VUP)-19 DET Point Mugu, the Navy’s first unmanned patrol squadron. Maintainers are conducting training and tests on the Triton aircraft before it deploys to Guam later this year. Point Mugu has also completely refurbished an existing hangar that will accommodate up to four Triton aircraft with its 130.9-foot wingspan. The first two Triton aircraft are located at Point Mugu. Brian Chappel, sector vice president and general manager, Autonomous Systems, Northrop Grumman, joined Doug Shaffer, vice president, Triton programs, Northrop Grumman, and Rear Admiral William Wheeler III in cutting the ribbon on the refurbished hangar. Built by Northrop Grumman, the MQ-4C Triton is an unmanned intelligence, surveillance and reconnaissance aircraft system with an autonomous capability that is piloted from a ground station. Triton can fly for up to 24 hours and reach altitudes of up to 55,000 feet. Flying high above the battle space, Triton provides a critical common operating picture, disseminating images and near-real time video to commanders around the world.